Hospital ID badge dangling from his neck, Angus considered the empty bed in front of him. After a few strong sniffs, he moved on. Nearing the next bed, his floppy ears perked up before he stopped dead in his tracks, tapping his paw and eyeing his handler expectantly. 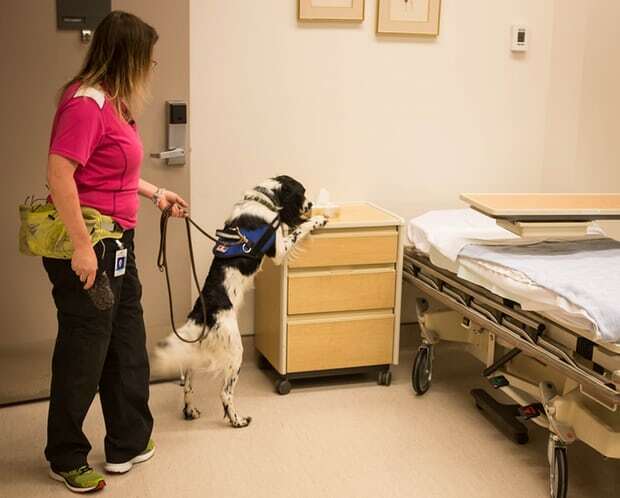 The two-year-old English springer spaniel is believed to be the only canine hospital employee in the world trained to sniff out the notorious superbug clostridium difficile, or C difficile. The seeds of Angus’ unlikely career were planted three years ago, after Teresa Zurberg, a Vancouver resident, suffered a C difficile infection. Her bout with the bacteria – which attacks people whose immune systems have been weakened by antibiotics – left her in the hospital for five days and she lost 20 pounds. “It was awful. I almost died,” Zurberg said. Her husband, Markus, a nurse who works in patient safety and quality care, stumbled across an article on a beagle in the Netherlands who had been specially trained to check patients for C difficile. Could Zurberg – a canine handler who trains bomb- and drug-detecting dogs – do the same thing in Vancouver? he wondered. “I told him, ‘If it’s got a smell, I can teach a dog to find it,’” Zurberg said. Their new English springer spaniel pup might be perfect for the job, she suggested. Working with the health authority, Zurberg and Angus became part of a one-of-a-kind pilot program. The hope, said Nancy Desrosiers of Vancouver Coastal Health, was to find an innovative approach to address what has become a global concern. Unlike the patient-sniffing beagle in the Netherlands – who is now retired – Angus, it was decided, would focus exclusively on searching for C difficile in the hospital environment. Hospitals normally use ultraviolet light to find the bacteria, but Angus can move much more quickly and efficiently through rooms. Once he detects the bacteria, the area is cleaned with a robot that uses ultraviolet light to disinfect 99.9% of the C difficile spores. The decision to have him work on environments rather than patients minimised the chances of Angus triggering patients who may have allergies or sensitivities to dogs. With the dog’s role in the hospital now clearly laid out, Zurberg began training Angus, mimicking the techniques used to train dogs to detect bombs or drugs. As she taught him to associate the scent with a food reward, researchers from the hospital kept her stocked with a steady supply of the scent of C difficile – isolated from the bug – on cotton swabs. The training took about 10 months. After passing a series of detection tests in a local nursing college with mock patient wards, Angus was brought into the hospital this summer. Easily excitable when he’s not focused on work, Angus is accompanied by Zurberg at all times during the four days a week he spends at the hospital. Like any other member of the hospital staff, Angus faces a slight risk that he could be infected by C difficile. “He’s young and he’s not autoimmune compromised, so his risks are extremely low,” Zurberg said. His health is carefully monitored through regular veterinarian visits, she added. His stint at the hospital has attracted global attention, and health authorities from Finland to Chile have contacted Zurberg with questions about replicating the idea. The aim, said Zurberg, is to develop a program that would train other dogs to sniff out C difficile and make them available to hospitals around the world. Zurberg’s voice raises with excitement as she contemplates the possibility that Angus might hold the key to regaining control over a superbug that has affected so many people around the world.